This tutorial is an example walk-through about using the Group Cloning Tool to copy the attributes of a group to create a new group, which can then be changed to suit its new purpose. In this example there is only one target or "slew component" defined in the initial existing group. 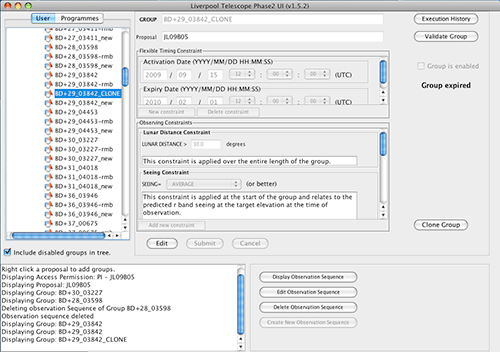 If the group you wish to clone has many slew components within its observation sequence, the cloning dialogue will be slightly different from the example discussed here, as the targets to be specified in the clone will have to be edited manually using the observation sequence editor. We begin by assuming that you have already created the GROUP structure along with timing and observing constraints and observation sequence. The above dialogue includes a text box for you to enter the name of the newly cloned group. By default this is initially set to the name of the original group, with the post-fix "_CLONE". As previously stated, the observation sequence of the original group only has one slew component within it (i.e. 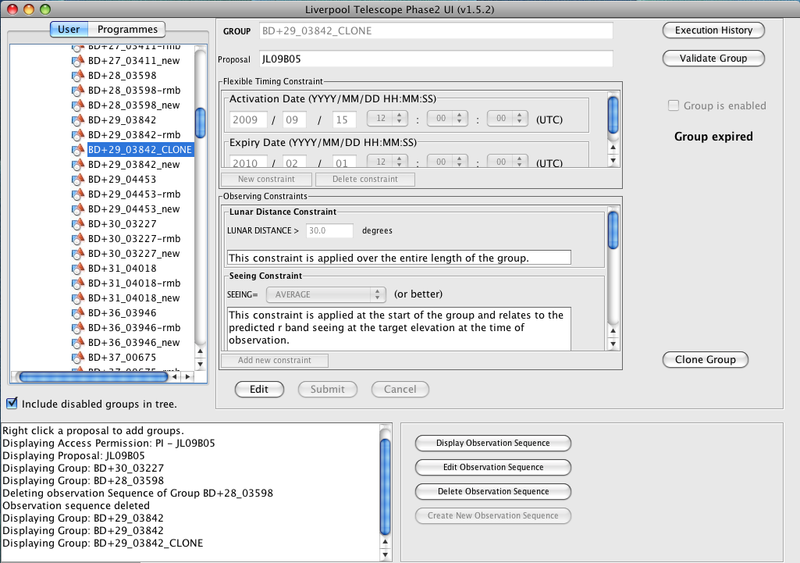 one target is specified within the sequence). In this common circumstance, the dialogue makes it easy to change the target to be slewed to in the newly created group. Use the drop-down combo box to select a different target (from within the same programme) or use the "Create New Target" button to create a new target to use. Once you have selected a target to use (or kept the same target) click "Submit" to create the new group with the parameters specified.